UUSI!! Crystal Sands Beach House II Indian Rocks Beachillä! Tervetuloa Crystal Sandsin rantaan House Indian Rocks Beachillä! Kotisi poissa kotoa Indian Rocks Beachin pienessä rannikkokaupungissa. Hiljattain remontoitu kaikkiin uusiin huonekaluihin ja kaikkiin kodin mukavuuksiin. Ilmainen WiFi ja kaapeli-tv DVR: llä ja Smart TV: llä Netflixin ja Hulun yhteyteen. Olemme sisällyttäneet vaunun, jossa on rantatuoleja, sateenvarjoja, pyyhkeitä ja rantaleluja lapsille. Hyvin puhdas! Pysäköi auto aivan laitteen eteen. Ei portaita tai pitkä kävelymatka matkatavaroiden tai päivittäistavaroiden kanssa. BBQ ja ulkona picnic pöytä. Great location, 1 korttelin yksi parhaista rannoista Floridassa upeita auringonlaskuja. Myös 1 - 3 korttelin joitain parhaista ravintoloista, kuten Guppies, Keegan's, Chicago Jax, TJ, italialainen, Pajano's, Salt. Siellä on polkupyöränvuokraus, meloa lautavuokraus, surffauskauppa, jäätelökauppa, hieronta kylpylä, syötti ja puuttua ja Englanti pubi samassa kadulla. Lapsille on upea puisto (Kolb Park) korttelin päässä. Ole keskellä kaikkea ja nauti rauhallisesta paikasta. Indian Rocks Beach on aivan Clearwater Beachin ja St. Pete Beach. Ei ole korkea nousu ja rajoitettu ranta pysäköinti siis, se on kaikki sinun nauttia! Matkustaminen isolla ryhmällä? Ei ongelmaa!! Tiedustele Crystal Sands I: n ja Crystal Sands ll: n varaamisesta. Varaa molemmat yksiköt perheen lomat, useat perheet tai suuret ryhmät. Yksiköt ovat aivan vierekkäin. Asunnossa on vain kaksi yksikköä. Molemmissa ominaisuuksissa on 4 makuuhuonetta ja 2 kylpyhuonetta queen-vuodesohvalla. Vuodepaikkoja 10 yhteensä. Tule jäädä Crystal Sands Beach House tänään! Great location, being off the more touristy area a bit it was perfect for our family. Absolutely adorable interior. A total bonus, they have all the extra beach stuff (wagon, floats, pails, shovels, etc) for your use, which was fantastic. Love this area and place! This cute, two bedroom-one bath, was clean and comfortable. It had everything we needed, beach chairs, umbrella and a wagon. We did most of our cooking there, too. We enjoyed having our coffee outside on the picnic table, very peaceful. The neighbors were friendly, too. It was only a couple blocks to the beach, close to many eating places and bike rentals. We love this place and the great location. We will stay here again! What a great place to stay!!!! Beautiful place and centrally located! We had the best time! Thank you to Nicole - she provided us with a great place to stay - it was well equipped - bright, comfy, plenty of space and so centrally located to the city and beach! We walked - everywhere! Downtown, ice cream, lunch, dinner....so close to everything. We went to the beach just about everyday; we packed a lunch and everything we needed for the beach was provided (chairs, umbrella, picnic bag, etc.) We also rented kayaks and went on the intercoastal near us - a beautiful ride and so peaceful. Had all we needed inside. Loved that we were located close proximity to local eateries plus quick access to major routes for visiting other towns. Loved the neighborhood with the ball park and nearby dog park. Will definitely consider same location if we come back to Florida. Recommend it highly. Perfect Little Beach House - Excellent Location! We've been in several very nice vacation rentals over the years - this was definitely one of the best-fitting ones overall for our family. The duplex cottage was very clean and really nicely decorated. The neighborhood is very quite - it is a residential area and the neighbors were very friendly, nice, and quiet. Inside, it had the perfect amount of room for a family of 4! Outside it had a small, very nice patio where we enjoyed observing little lizards running around, reading a book, and playing. It basically had everything we needed and wanted on our vacation. There are several great restaurants walking distance (~5-30 min. ), an awesome French bakery (~15 min. ), a small convenience store (~5 min. ), playgrounds, a nature reserve with a board walk (~10 min) and several beach access points (~5 min. walk)! The beach is beautiful! For vacationers wanting to cook more at home (we only had breakfast and made sandwiches at home), a few extras in the kitchen would be helpful. Also, the location of the overhead air conditioning vents in the bedrooms, when air condition is needed at night, might be troublesome for some. 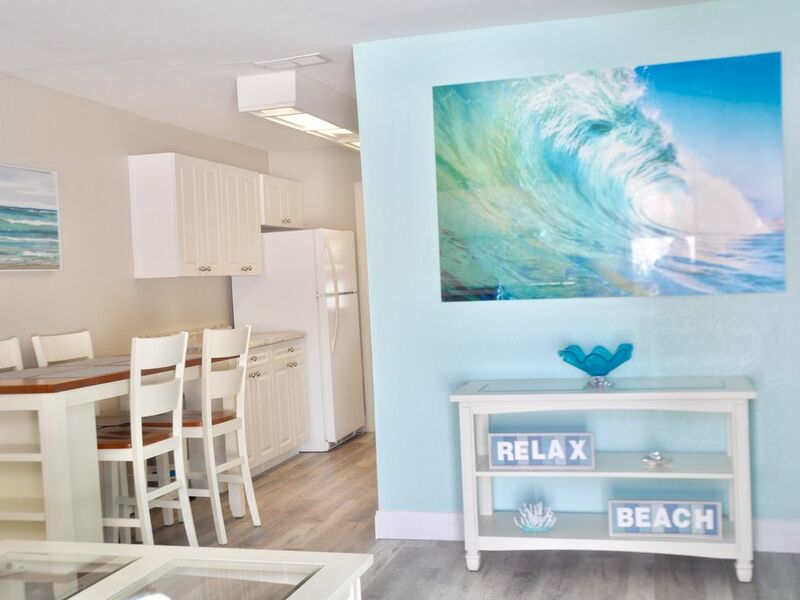 Overall though, the whole house air conditioning system is new and works very well.This little home away from home is the perfect place to relax and enjoy a beach vacation. Looking forward to be back soon! We enjoyed our stay. Nicole was very responsive to our needs. Overall great experience. Wish the kitchen was equipped with few extras; such as dish drying rack and some serving dishes.